Help your little one fall asleep with this sleepy baby doll that they can take a nap with. Make nap time more enjoyable for little ones by incorporating this sleepy little nap time doll. This doll pattern is for two baby dolls made out of cotton fabric and other materials. 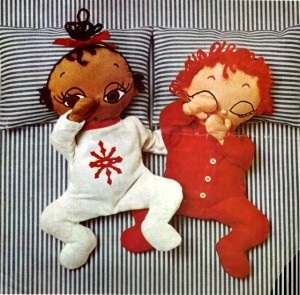 One doll is light pink with red hair while the other is dark brown with black hair. These soft huggable dolls have the look of a small baby with sleepy eyes that are great for holding during nap or bed time. Get started on sewing these precious little baby dolls to give to your child or as a thoughtful gift.